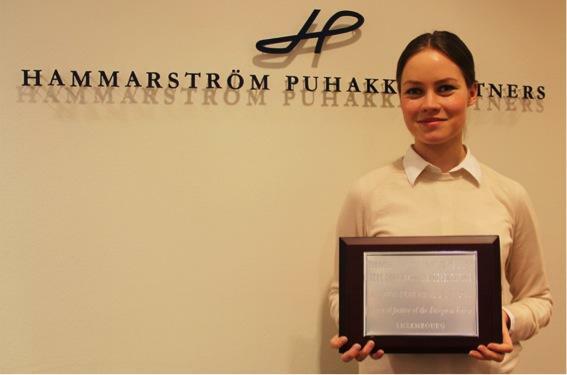 Trainee at HPP, Mirka Kuisma, has won the award of the Best Commission Representative in the 2013-2014 European Law Moot Court competition (ELMC) in the individual competition of Commission Representatives. The prestigious ELMC competition comprises three categories in which mainly European and American law students compete in the field of EU law. The best team prize was awarded to Maastricht University and the prize of the best Advocate General to College of Europe. Kuisma competed as a member of the team of University of Turku. The All-European Finals of the ELMC were held at the Court of Justice of the European Union in Luxembourg on 28th March 2014 and were preceded by written and oral qualification rounds in four Regional Finals. In the All-European Finals the performance of the students was judged by acting judges and advocates general of the Court of Justice. More information on the competition can be found on the ELMC webpage.